We request all patients coming in for a first visit to print the patient forms given below, fill them out and bring them along. This will help us expedite the check-in process considerably. 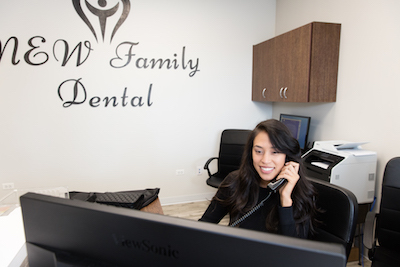 At New Family Dental, we are committed to guiding our patients to maximize the ways their dental insurance can help them pay for dental services. We will work with our patients to navigate their dental insurance plans and to find the most affordable way to receive the quality dental care they deserve. New Family Dental welcomes your dental insurance. Our office will file your insurance claims and assist you with the cost of treatment if it is not covered in full by insurance. We will be happy to estimate your expected payment before any dental procedure. Since we cannot guarantee payments by insurance companies, it is ultimately the patient’s responsibility to verify benefits and to pay for any remaining balance in the end. We also accept major credit cards (Visa, MasterCard, American Express and Discover). It is important to be proactive in taking care of your dental health. Regular check-ups are needed to make sure you avoid bigger and more costly dental problems in the future. Contact Maya Dental for more information on insurance and to schedule your appointment today. Contact our experienced staff to learn more about payment options that are available.